Maison-École is a combination of adjacent urban properties that were transformed into a series of spaces for family activities and entertaining. Using the elements of earth, water and fire, this design creates a garden sanctuary for an active and growing family. The project was installed over time, with the most recent phase completed in 2013. 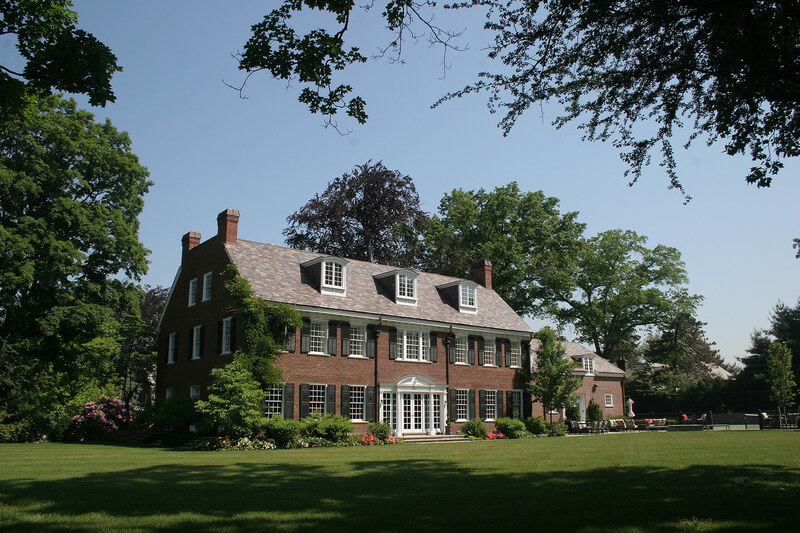 The main house scope included a new pool, pool pavilion, spa, fireplace, pergola, sculpture terrace, fountains, lighting and planting. Early project design included a new driveway, fencing and gates, and service parking with half-court basketball. The adjacent property, once used as a school, provided the opportunity for repurposing the house as a large indoor basketball facility. The landscape scope included a baseball field, batting practice cage, tennis court, and terrace with a large firepit. A gently stepped pathway connects the two properties. 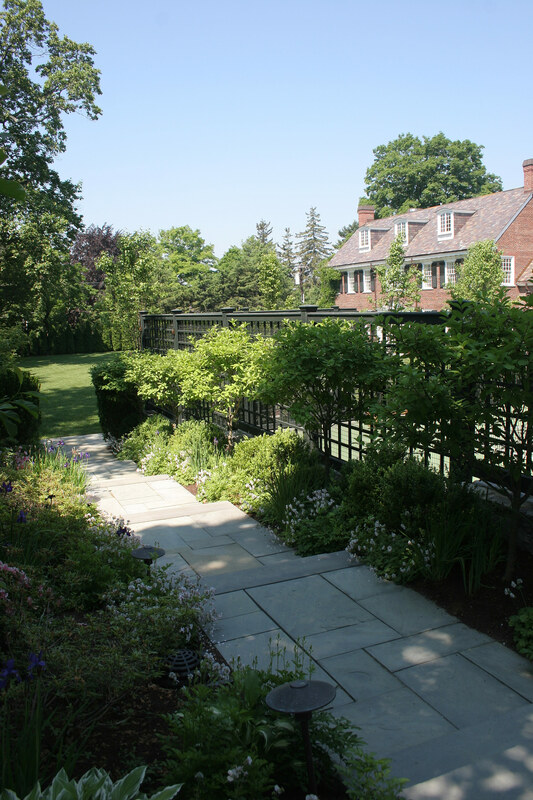 The site is designed for comfort and heavy use by a large family, and contains all the ingredients of a private club. Shaded seating in a covered pavilion anchors the spa and outdoor kitchen. 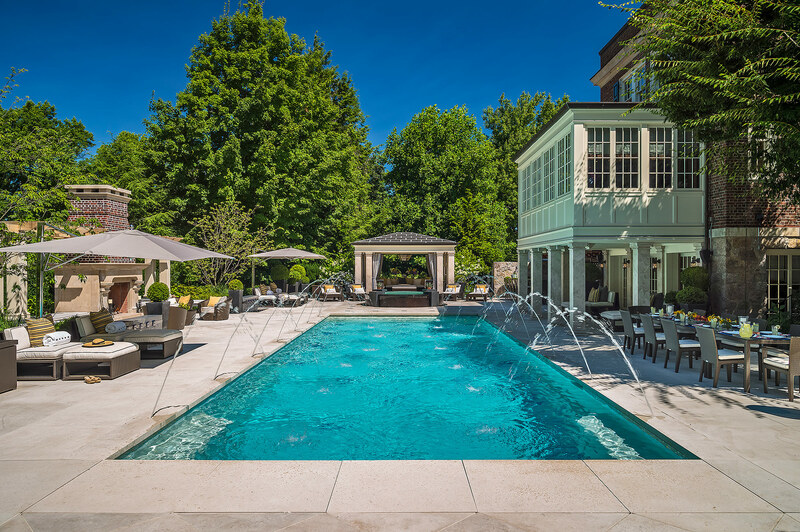 The fireplace provides comfort on cool nights, and radiant heating under the paving keeps the spa area accessible throughout the winter months. 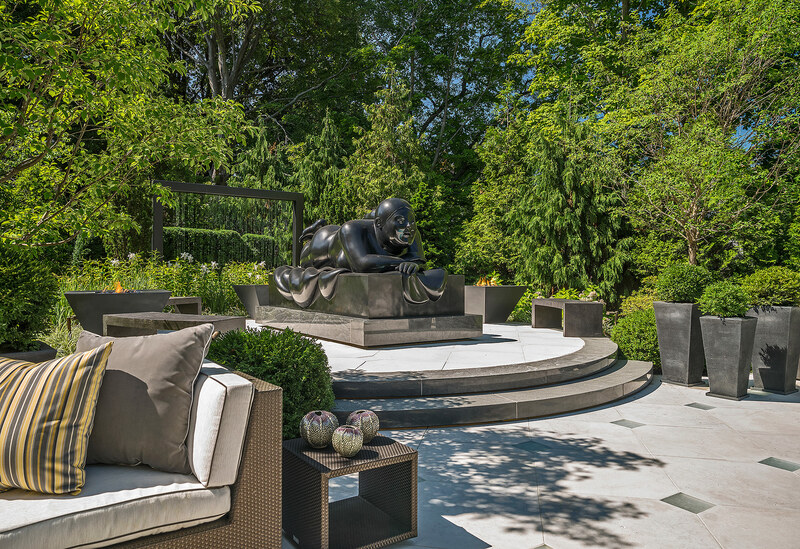 The client’s large bronze sculpture rests on a raised dais and is surrounded by fire features which add reflective light at night to the warm metal tones of the reclining woman’s figure. The dark color of the bronze is set apart from the deep greens of the planting by a wall of water which creates both a light screen and sound attenuation for the neighboring street traffic. Limestone was selected as the paving because of its light color, minimal heat absorption and visual connection to the architectural elements of the historic brick and limestone house. Strong geometric paving and light patterns connect the many features within the landscape. The entire pool has a glass tile pattern similar to the design of the limestone paving. Dark granite steps, fountain blocks, seating and edging are used as functional contrasting elements. Water is used throughout the garden. A rain curtain sited behind the sculpture brings movement and sparkling light to a shady spot in the garden. Jets at the pool coping use recirculated water to cool the urban atmosphere. Water emerges out of blue glass blocks set within large dark granite slabs, defying the apparent solid structure and framing the entry into the fireplace terrace. The spa is designed to cascade over the bronze and glass sides. Lighting is an important design element and creates a warm and inviting scene at night. Glass pavers within the limestone pattern add texture and color as well as a soft glow in the ground plane. LED lighting under the monolithic block steps assure safe passage and highlight the geometry. The spa glistens as the water flows over the bronze cladding, illuminated by fiber optic light rings and glass jewels in the perforations. Fiber optic lights in the pool bottom reflect the night sky. The planting palette is predominantly green and white. The simplicity of the color choice frames a complex design and reinforces an atrium concept by creating green walls and accents. Engineered soils and drainage systems assure that the lawn area is ready for play regardless of the weather. Throughout the site, runoff is collected in multiple infiltration units. INTERIOR DESIGNER: Carolina Tress Balsbaugh at MDS, Inc.
CIVIL ENGINEER: Waterman Engineering, Laura Aibel at Stiarna Enterprises, Inc.